The "common cold" is a nickname for the commonly occurring viral infections of the upper respiratory tract. More than 200 different viruses can cause colds. Rhinoviruses are responsible for up to a third of all upper respiratory infections. Other common viruses that lead to stuffy heads and runny noses include adenoviruses (ah-deh-no-VY-rus-sez), coronaviruses (ko-ro-nuh-VY-rus-sez), parainfluenza (pair-uh-in-floo-EN-zuh) viruses, respiratory syncytial (RES-puh-ruh-tor-e sin-SIH-she-ul) virus, coxsackieviruses (kok-SAH-kee-vy-ruh-sez), echoviruses (EH-ko-vy-rus-sez), and influenza (in-floo-EN-zuh) viruses (although influenza may also trigger more serious complications). Children get colds most frequently, in part because of their close contact with so many other children in daycare or school. Younger children also tend to cough without covering their mouths and do not regularly wash their hands. In North America, young children in daycare may catch several (sometimes as many as 10 or more) colds each year. People tend to get fewer colds as they grow older because they develop immunity * to some of these viruses after being infected with them. For this reason, healthy adults average 2 to 4 colds a year, and those over age 60 tend to get even fewer (maybe 1 cold a year, or less). Cold season in the United States generally occurs during the fall and winter months, although people can get sick from viral respiratory infections year round. Many people believe the cold air is responsible for catching a cold, but there is no evidence that viruses spread more easily or that our immune system is weaker in the cold. However, winter is the time of year when more people stay inside, bringing them into closer contact with others and their germs. As many as a billion colds occur each year in the United States. The U.S. Centers for Disease Control and Prevention's National Center for Health Statistics notes that on a yearly basis close to 22 million school days are lost due to illness from colds, and 45 million days are spent resting while recovering from colds. Colds are very contagious. In general, they are most contagious during the first few days of illness, when symptoms like congestion (stuffy nose) and sneezing are starting. Cold viruses often spread through direct contact. Shaking the unwashed hand of someone with a cold (who has just touched his or her face) can easily spread the virus. When an infected person laughs, sneezes, or coughs, virus-packed droplets of moisture from the person's mouth and nose can become suspended in the air, where they can be inhaled by others. Sometimes these drops of respiratory secretions land on a surface such as a kitchen or bathroom counter, where they can infect the next person who comes along and touches the surface. What Happens to Someone Who Has a Cold? Cold symptoms usually appear within 2 to 3 days after the person becomes infected. They often include a runny or stuffy nose, watery eyes, coughing, mild muscle aches, tiredness, headache, low fever, and a scratchy, sore throat. 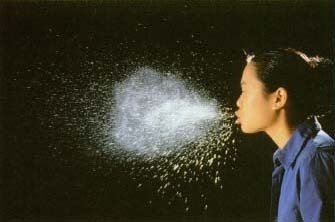 Sneezing and coughing up mucus * are also common. MYTH: Running around in the cold and having a wet head or wet feet can bring on a cold. REALITY: These two beliefs probably stem from the accurate observation that more colds seem to occur in the cold, wet weather that often accompanies winter months in the United States. In reality, though, it is not the cold or wet that brings on the illness. Colder weather drives people indoors, which means increased and closer contact with others and a higher risk for colds. MYTH: "Feed a cold (and starve a fever)." REALITY: A recent study found that eating might actually boost the power of the immune system against certain illnesses, such as long-lasting colds, whereas decreased food intake may stimulate immune system chemicals that keep fever away. Until more studies are done, many doctors continue to urge patients with colds to down warm soup and other light fare. MYTH: Taking large doses of vitamin C prevents colds. REALITY: Vitamin C may have other body-boosting benefits, but there is no scientific proof that it prevents the common cold. Although garlic (which may have antiviral properties) and chicken soup appear to have some beneficial effects, studies of other widely touted cold remedies such as echinacea (eh-kih-NAY-see-uh), a plant product, and zinc supplements have mostly yielded negative, inconsistent, or unconvincing results. Doctors diagnose colds based on a history of symptoms and findings from a physical examination. Cultures * and other tests for the viruses are available but are not done in most situations. However, the doctor will want to distinguish a cold, caused by a virus, from bacterial infections of the sinuses or throat, such as strep throat. This high-speed photograph captures a sneeze in action. Virus-packed droplets are expelled from the respiratory system and can spread widely to contaminate surfaces. At the present time, there remains no true medical "cure" for the common cold. People who come down with colds can help themselves feel better by taking care of themselves at home until the infection goes away on its own. Bed rest helps tiredness, and inhaling mist in a steamy bathroom or running a humidifier in the bedroom to moisten dry air can relieve congestion and make it easier to breathe. Drinking plenty of clear or warm fluids may also reduce congestion, and tea with honey can soothe a scratchy throat. Over-the-counter medicines such as acetaminophen (uh-see-teh-MIH-noh-fen) can ease headaches and body aches and lower fever. Over-the-counter cold medicines may also help relieve symptoms. Symptoms of a cold can last up to a couple of weeks, but most people recover within a few days. Because viruses cause colds, antibiotics are not useful in fighting these infections. Scientists are studying newer antiviral drugs that may be effective in fighting some cold-causing viruses (such as rhinoviruses). These medicines might change the treatment of colds in the future. * eustochian (yoo-STAY-she-un) tubes are the tiny channels that connect and allow air to flow between the middle ears and the throat. * sinusitis (sy-nyoo-SY-tis) is an infection in the sinuses, which are hollow cavities in the facial bones near the nose. Sometimes colds can cause swelling and irritation in the nasal passages, eustachian tubes * , and airways leading to the lungs. Bacteria that invade the body can flourish in these areas, causing additional infections. This is why it is not uncommon for someone to develop sinusitis * , an ear infection (otitis, o-TIE-tis), or bronchitis at the end of a bad cold. For those with weaker immune systems, such as the very young, the elderly, or those with chronic illnesses, these secondary infections can lead to breathing problems from severe bronchitis or pneumonia, which may sometimes be life threatening. Colds also can trigger flare-ups or worsening of respiratory symptoms in people who have asthma. To lower the risk of catching (or spreading) a cold, experts advise that people wash their hands frequently and cover the mouth with a tissue when coughing or sneezing. Avoiding touching the eyes or nose as much as possible, regularly cleaning bathroom and kitchen surfaces to get rid of germs, and avoiding close, extended contact with anyone who has a cold are also helpful. Researchers have explored the idea of a cold vaccine, but many different viruses can cause colds, making the development of a single, effective vaccine a great challenge. U.S. National Institute of Allergy and Infectious Diseases (NIAID), Building 31, Room 7A-50, 31 Center Drive MSC 2520, Bethesda, MD 20892. The NIAID, part of the National Institutes of Health, posts information about viral infections that cause colds at its website. KidsHealth.org . KidsHealth is a website created by the medical experts of the Nemours Foundation and is devoted to issues of children's health. It contains articles on a variety of health topics, including the common cold.